Epilepsy is a disorder caused by a sudden discharge of a large number of neurons in the brain, leading to an attack. 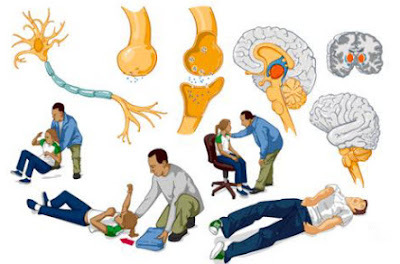 The most common is epilepsy in children, young people as well as people over 65 years, a similar seizures can occur in people who have epilepsy, due to metabolic disturbances, intoxication, withdrawal of alcohol syndrome, high fever, infection, electric shock and other factors . What are the causes and symptoms of epilepsy and how it heals natural and alternative methods, find out in this article. After we roughly listed how is usually manifested in children and adults, now we will deal with each of these stages. This stage is preceded by an acute attack. During this stage people often change mood and behaviour or have a headache that lasts for hours, even days. There is a change of sense of smell and hearing, the patient often has hallucinations. The electrical activity that involves the whole brain leads to loss of consciousness. Prodrome is not to be confused with the so-called aura, which represents the beginning of seizures and includes palpitations, turning heads and eyes, as well as sensory hallucinations. Vegetative phenomena: the scaling up of blood pressure, pulse rate acceleration, increased pressure in the bladder, spreading of pupils, pale, and then the blue colour of the face. It lasts only for 30-45 seconds, and begins with a slight trembling and progresses to severe spasms of all muscles of the body and face, as well as the jaw and tongue, and the appearance of bloody foam in the mouth. Consciousness returns after three to five minutes, and the person affected is confused, disoriented, and there is uncontrolled urination. This phase ends with the dream from which the person wakes up exhausted and collapsed. If you find yourself next to a person who has an aura, help that person to be comfortably placed in bed or on the floor and put her head under the appropriate pillow, blanket, or other soft material that will not irritate the skin. The patient should be as comfortable as possible and remove all sharp or hard objects, if they are somewhere in the vicinity of them, in order to protect the person against possible injury. Do not attempt to force open the jaws, nor to restrict movements during seizures, because due to strong contractions you may cause serious bone fractures. You should not give water, medicines and so on, until they fully regain consciousness. It is very important to stay calm and to carefully monitor the situation, particularly with children. Any information is valuable, both for the patient and for the doctor (to determine in detail all symptoms of epilepsy before and during seizures). WHAT ARE THE TYPES OF EPILEPSY? By origin, the epilepsy in children and adults is divided into idiopathic (unknown cause) and symptomatic, which is caused by head injury, bleeding in the brain after a stroke, bacterial and viral encephalitis, brain surgery, complications in childbirth, poisoning alcohol or tumour. When epilepsy in children is diagnosed early in life, be sure to look for information on other cases in the family, in order to obtain a detailed neurological status of the whole family. It is important to note that not every form of the disease is hereditary, so additional tests are needed. Practice has shown that epilepsy is inherited only in ten percent of cases, and if only one parent is affected the chances are far less. Epilepsy in children is largely kept under control with proper diet, the same goes for adults. All patients must avoid consuming alcoholic beverages and do regular moderate exercises. The so-called ketogenic diet is used, which means avoiding foods that contain only carbohydrates (bread, cookies, pasta, other cereal products, rice, polenta, potatoes, and sweets). This means that, when it comes to the daily intake of calories, fat dose must be three times the amount of other nutrients. Of course, it is necessary to take into account the type of fat: the most preferred are those from plant cold-pressed oils, nuts and seeds. On the other hand, it is important to limit the intake of animal fat in eggs, meat and milk products, to increase the share of fruit and vegetables every day and consume about two litres of water or herbal teas. The body is necessary to have a greater amount of vitamin B (recommended brewer's yeast) and magnesium. Monosodium glutamate (monosodium glutamate - MSG), an emulsifier which is usually added to improve the taste (E 621), became part of many industrial foods, but it was proved that it destroys brain, disrupts hormone secretion and promotes the development of many diseases, including epilepsy in children and adults, dementia, severe headache, Alzheimer's disease and multiple sclerosis. This neurotransmitter stimulates nerve cells which then suffer due to the excessive electrical activity. Also, a large amount of neurons die before they manifest clinical symptoms of the disease. MSG is routinely added to fast food, soups from the bag, various spice blends, many preparations for weight loss, cold meats, salty snacks, cheese spreads, mayonnaise, prepared dishes. In folk medicine lady's bedstraw is recommended as a natural remedy for epilepsy, hysteria, chorea (muscle spasms and twitching of the limbs, torso, head and face), nerve disease, jams and urinary problems caused by sand and stones in the kidney. Recipe: Two tablespoons of lady's bedstraw pour with two cups of boiling water and after two hours strain. Drink half a cup 4 times a day before meals. Epilepsy in children and adults is in no way be taken for granted, nor should you prepare recipes on your own -without consultation with herbalists and doctors. In 3 decilitres of water cook 2 tablespoons of chamomile, 1 dl wine vinegar and a teaspoon of honey for one minute. Drink little sips, twice a day. When the patient feels that the seizure will start, it may be helpful to inhale vapours from cooked garlic. Pour lavender with white wine and drink in sips during the day. Tincture of rosemary is a great natural cure for epilepsy. Sage leaves boiled in wine are an excellent potion against trembling, convulsions and epilepsy. Mistletoe tea: 15 g of twigs with leaves and fruits of white mistletoe pour with one cup of boiling water. Drink the soup spoon three times a day. NOTE: If taken in large quantities, mistletoe can be toxic, so it is necessary to consult with herbalists before using it. Epilepsy in adults can be kept under control with valerian tea: pour a cup of boiling water over 2 to 3 g of valerian and after 20 minutes, strain it. Drink 2-3 times a day. Eat as much onion as you can or drink the juice of this beneficial vegetable. Epilepsy attacks become weaker and less frequently repeated because of this vegetable. Pour 10 g of oregano with 3 dl of boiling water, cook for 15 minutes, and drain. Drink half a cup three times a day, fifteen minutes before eating. We hope that you will find out what epilepsy is and how to treat it in children and adults – with natural and alternative methods, if you like the article, share it with your friends.